When Noah was born I was lucky enough to be sent a Snoob scarf to review. 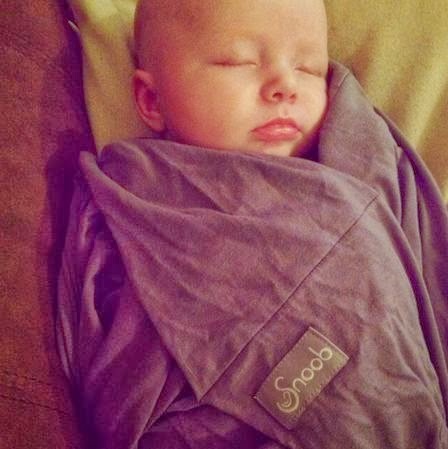 The Snoob Scarf is a stylish breastfeeding scarf but it doesn't end there. It's also suitable for wrapping baby up when they are napping, great for wearing when you are snuggling up to your little one and stylish enough to wear as a fashion accessory with your favourite outfit! There are numerous uses for this fab scarf! I had intended to breastfeed but unfortunately it didn't work out for us. I know that if we had been successful that the Snoob scarf would of been invaluable to me. Not only does it look and feel great but you can feed your baby discreetly all while keeping him snug as a bug. All you need to do is loop the scarf around your neck, place baby underneath and hey presto! You don't even need to take baby out to wind. A breastfeeding essential. Even though I bottle feed my son I still have a dozen uses for our Snoob and Noah and I both love to take a nap wrapped up in it. You can find more info and the full range here. - I was sent this item for the purpose of this review. However all opinions are my own.